Apart from great desert tours, we also offer various day tours departing from Marrakech or Fes for your selection. Jimi Hendrix visited once, and he should have stayed in this picturesque, laid-back artist colony which is a three-hour drive from Marrakech. Situated on the Atlantic coast, Essaouira has a steady year round temperature at the 20°C . The expansive golden beach is popular with windsurfers. Famous fresh grilled seafood is served at the port, and in the medina Thuja wood carvers and silver crafters work under the old Portuguese ramparts guarding the city from the sea. One of the most charming walkable medinas in all of Morocco. Recommended year round, especially in summer when it makes a nice relief from Marrakech heat. 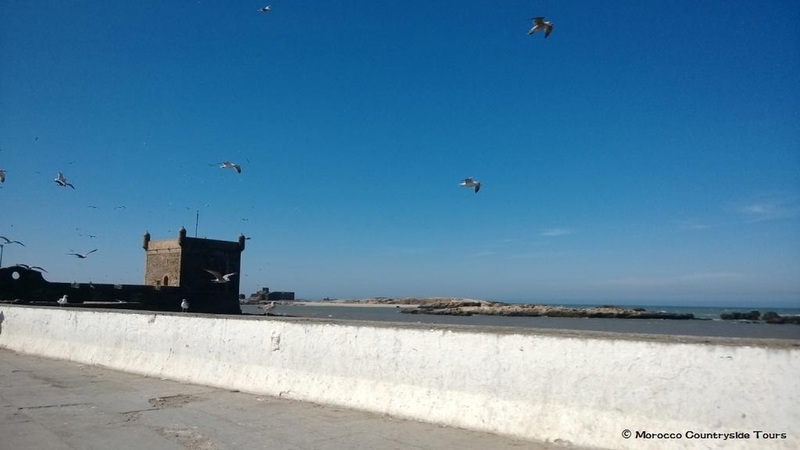 2 Days/1 Night Tour to Essaouira is also available to let you have ample time to visit medina in Essaouira and enjoy beautiful sunset by the sea. Please contact us for more information. Just 1.5 hours from Marrakech, this pleasant journey into the High Atlas mountains takes you through winding Ourika Valley roads ending at the village of Setti Fatma. Climb the waterfalls, enjoy the breathtaking vistas, running streams, and afterward, enjoy the locally made tagines or try a Berber omelette. An unspoiled hike above Setti Fatma, explore remote villages on pretty mountain trails used by Berbers going to and from the market with their donkeys. On every Monday, you can visit the market in Ourika, where artisan manufacture handicrafts found in Marrakech souks, such as colored glass, metal tin lanterns, hand painted and carved furniture, wicker terrace furnishings and High Atlas village style carpets. Recommended year around, especially in summer when it makes a nice relief from the heat and dust of Marrakech. There is possibility of snow and cold conditions from December to February. This beautiful green lush location with its majestic waterfalls, is situated in the front ranges of the High Atlas. A day in nature is only 3 hours away and a welcome relief from the heat, and busy city of Marrakech. And if the weather is cool and rainy, even better! The falls swells with runoff and can be spectacular in the rain. The gorge below the fall is en endless series of the pools that offer some fine day hiking with varying views up and down the valley. This future Bio Reserve is home to wild Barbary Apes and makes for some interesting bird watching. Nearby the Berber villages in the surrounding hills are perfect for walks any time of year, and in any kind of weather. Have lunch in one of many simple terraced restaurants or chill out with a glass of wine on a riad terrace overlooking the falls. This day involves walking on cliff side trails and stair climbs. In July and August, the falls are popular with Moroccan on holidays. In the morning pick up from your Riad in Marrakech at 8am and travel through the High Atlas Mountains via the Tichka pass (2260m), the highest road passing in Morocco. It offers panoramic views of the snow capped High Atlas Mountains and the magnificent landscapes. Visit the extraordinary sights of the Atlas Mountains Kasbah Telouet for the glaoui family, then drive through Ounila Valley to visit Ait Ben Haddou, a UNESCO world heritage protected site built on a hilltop and featured in many movies such as Gladiator and Lawrence of Arabia. The views from the upper heights are awe inspiring and worth the required climb through the winding and narrow streets. After lunch in Ait Ben Haddou village, we will drive back to Marrakech and arrive by 7pm. Recommended year around. Chefchaouen, also known as Blue City or Blue Town, is located in the Rif Mountains at the northern part of Morocco. It is a charming city where you will find sky blue painted streets and traditional buildings and therefore it often attracts lot of tourists around the world to visit. We will pick you up at your Riad or hotel at Fes in the morning. It takes around 3 hours and half driving over the Rif Mountains to arrive at Chefchaouen. Then you can walk around to explore the white and blue washed walls of the medina. Its local markets also offer some unique handicrafts. After enjoying Chefchaouen and having lunch, we will then drive back to Fes. Your journey with us will end at your hotel / Riad. Volubilis, a Roman ruin near Fez, is one of the largest ancient ruin in Africa. Its history can be traced back since the third century B.C. Our guide will meet you up at your Riad or hotel at Fes in the morning and takes about 2 hours drive to Volubilis. After visiting Volubilis, we then drive to Meknes which is one of the imperial cities and once the capital of Morocco under the rule of Moulay Ismail. The old city of Meknes is surrounded by thick ramparts. After having lunch in Meknes we will drive back to Fes. Your journey with us will end at your hotel in Fes.